For more than two decades, the music venue has showcased some of the best talent to pass through Gainesville as well as top local bands. 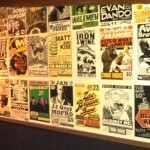 The vintage poster wall at High Dive. You could say that Pat Lavery was once the poster child for the downtown music venue now known as High Dive. That is, in his younger years he’d go around Gainesville and post announcements of upcoming shows for what was then called the Covered Dish. Today, Lavery gets into High Dive for free by booking all the acts there—and at several other venues around Florida—through his Gainesville-based promotions company, Glory Days Presents. Lavery and the High Dive staff keep things hopping almost every night of the week with live music as well as special events, such as standup comedy, art shows and food truck rallies. Lavery said High Dive is a little unique in Gainesville in that he tries to book anyone people want to see. “We’re looking for bands and events that will fill the room on a regular basis,” Lavery said, adding that he often gives local musicians opportunities to open for touring acts. Each recent decade of college students remembers the Southwest Second Avenue venue by a different name. In the 1980s, it was the Spectrum Disco catering to a gay crowd. Grace Jones gave rousing performances there. Other dance clubs followed on the site but didn’t last. In 1992, businessman Bill Bryson purchased the vacant venue and opened the Covered Dish, showcasing up-and-coming rock, punk and indie acts. The Dave Matthews Band made its Florida debut there in 1994. A flyer from that show and many others are still posted in a hallway near the restrooms. Bryson had an AM station operating as community radio at the time. According to Bryson, the Dave Matthews Band was one of the first acts to accept credit-card payments for merchandise. They sold more than $1,500 in merchandise that night at the Covered Dish, more than they got paid for performing there. Green Day performed there right when the group was signing with Warner Bros. The Covered Dish gave way to Common Grounds, which opened in 2004 after operating as a storefront coffeehouse for several years on University Avenue. George Clinton and Kenny Chesney were among the big-name acts to play there before raucous crowds. Lavery and his business partners took over in 2011 and renamed the club Double Down Live. However, they soon learned that the name infringed on a Las Vegas saloon’s trademark. For alcohol, people can belly up to the L-shaped bar indoors or order from the outdoor bar on the patio deck and relax beneath the oaks. High Dive doesn’t serve food, but patrons don’t have far to walk for munchies. A food wagon is stationed outside the entrance. Five Star Pizza occupies the north end of the High Dive building. Across Second Avenue is The Jones B-Side. Around the corner is Wholly BBQ Café. Over Labor Day, High Dive played host to the fourth annual Less Than Jake Wake and Bake Weekend. The popular Gainesville-based ska/punk band headlined the two-day event, which drew fans from around the world. “The show is special to us,” Lavery said. “They’re one of the biggest Gainesville bands of the last 20 years. They were the first show I saw in Gainesville when this place was the Covered Dish. As the five-member band performed its high-energy act on stage and its smiley-faced mascot sent cascades of toilet paper and Silly String into the crowd, a few dozen fans formed a mosh pit down front. They were rowdy but not out of control. The tin-roofed High Dive building was originally a feed store with a pit in the floor for storage. Today, that pit—once a sunken dance floor—is covered over, but the place still has a roadhouse feel to it. And the music is what continues to draw throngs of people to many shows. And these days Lavery has others going around town putting up the flyers. Visit High Dive on the web. Follow High Dive on Facebook.